Ke-Myrion Anderson had never set foot on college campus before he spent a week at UC Merced in July. The Fresno eighth-grader was one of 150 students from across California who were invited to live and learn at the university as part of the Willie Lewis Brown Jr. Youth Leadership Development Program this summer. Anderson’s peek into campus life inspired him to keep his sights on college. 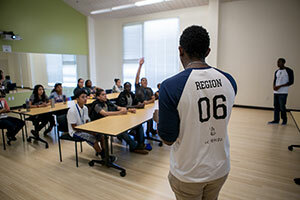 Mari Harris, a Student Affairs staff member who focuses on African-American student recruitment efforts, teamed up with UC Merced students to develop the summer program to bring young students to campus. The program was named after former San Francisco Mayor Willie Brown Jr. for his leadership qualities. Harris served as an Assembly fellow while Brown was speaker of the California State Assembly and said he played a critical mentorship role in her life. Harris partnered with the Fresno Unified School District, UC Merced’s Center for Educational Partnerships, the Metro Boys and Girls Club of Los Angeles, and Roberts Family Development Center in Sacramento, who selected the participants. Harris, a former Sacramento high school principal who spent 25 years in education, vividly remembers the summer she visited Cal Poly San Luis Obispo after her family moved from Texas. Her mother attended a program to earn her California teaching credential, and Harris and her two sisters stayed in the dormitory with her. “I was in middle school at the time she took us, and I was sold on college,” she said. Harris and her husband, Mark, a continuing lecturer of management and business economics at UC Merced and a practicing attorney in Sacramento, have mentored underprivileged students for the past eight years through their nonprofit, Central Valley Leaders. Sukhman Sekhon, who is from Selma and graduated from UC Merced with a degree in economics in 2015, has volunteered with Central Valley Leaders for years and was instrumental in developing the summer program. During the five-day Youth Leadership Development Program, students slept in residence halls, learned about leadership and careers, attended a class lecture and participated in team-building activities. They visited Yosemite National Park — most for the first time — and met park ranger Shelton Johnson and UC Merced researchers. They also spent a day with student-athletes at nearby Lake Yosemite. Like one-third of UC Merced’s student population, student leader Estefani Avila was the first in her family to go to college. 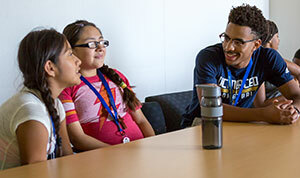 In addition to exposing young students to UC Merced, the summer program gave alumni the opportunity to pass the torch to incoming leaders like first-year student Andrew Williams. Williams, a public health major and a member of UC Merced’s men’s basketball team, graduated from high school in Sacramento in June. When he learned about Central Valley Leaders, he headed to campus early to serve as a student leader for the summer program.